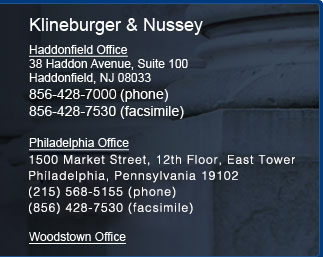 Frank J. Hoerst, III brings his strong reputation as an advocate in the area of criminal law, land use and civil litigation to his association with Klineburger & Nussey. Mr. Hoerst received his Bachelor's Degree from Temple University and his Juris Doctor from Stetson University. Upon graduating from Stetson, Mr. Hoerst began his legal career by establishing his own law firm. After establishing himself as one of the top trial attorneys in the State of New Jersey, he was then appointed as the Salem County Prosecutor. He has since been in private practice whereby his clients have included, Penns Grove-Carneys Point Board of Education, Salem County Vocational Technical School Board of Education (General Counsel), Carneys Point Township, Penns Grove Borough, Elsinboro Township, Pilesgrove Township Planning Board, Oldmans Township Planning Board, Oldmans Township (Public Defender), D' Anastasio Corporation, J.S. Hovnanian & Sons, Inc., Angeloni Development, L.L.C., Pilesgrove Solar Ventures, L.L.C., Quinton Solar, LLC & R.E. Pierson Construction. Mr. Hoerst has also been an active and well respected member of the New Jersey State Bar Association, whereby he has been appointed in the following capacities: New Jersey State Bar Foundation; Trustee, Treasurer, Secretary, President, New Jersey Supreme Court District I Ethics Committee (Former Member), New Jersey State Bar Association Judicial and Prosecutorial Appointments Committee, Salem County Committee, June 2001 to May 2008, Chair - June 2006 to May 22, 2008, New Jersey State Bar Association, Judicial and Prosecutorial Appointment Committee, State Committee, New Jersey State Bar Association Trustee, New Jersey State Bar Association, Nomination Committee Member and Chair, New Jersey State Bar Association: Military Law and Veterans Affairs Committee Vice-Chair, New Jersey State Bar Association - Co-Chair Senior Lawyers Committee, New Jersey Supreme Court Committee on Jury Selection, New Jersey State Bar Association - Mock Trial Competition "Certificate of Honor" (Judge) and Co-Editor of New Jersey Bar Association Publication. 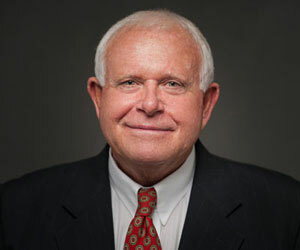 In addition to his State Bar appointments, Mr. Hoerst is a member and Past President of the Salem County Bar Association, and frequently lectures for CLE courses. When he has a free moment, Mr. Hoerst is a life time practitioner of Tang Soo Karate, where he earned a fourth degree Black Belt, is a certified dive instructor and has competed in many marathons and triathlons.